This run, along with the Chili Bar run on the South Fork of the American, is often considered the epitome of class III boating. It has amazingly easy river access from highway 299. 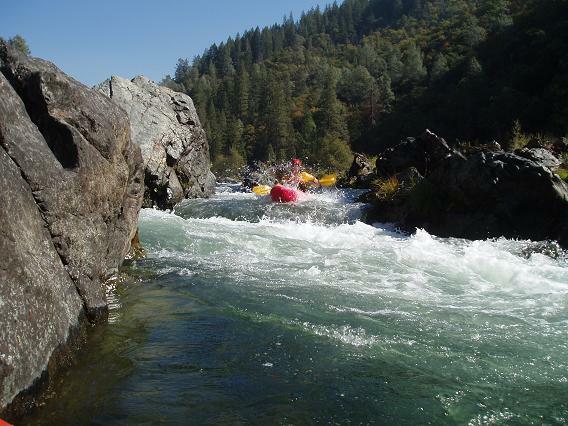 And most importantly…it is far less crowded that its American River counterpart. I first ran this stretch when I was thirteen years old or so as a river guide. My brother, James, worked for the better part of six years on this river as a guide while I only worked occasionally during summers for nearly the same stretch. But even with all this time on the run, neither of us got tired. 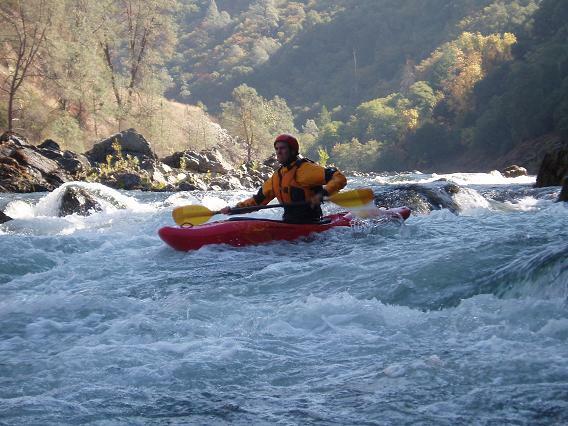 The run is great because with varying flows the rapids differ greatly in addition to amazing scenery and lack of crowds. (It also helped that due to family friends, we had free room and board and in later years our parents actual became residents of Weaverville providing yet more free room and board). A lot of books say that the run washes out above 4,000 cfs, but I promise you that is untrue. 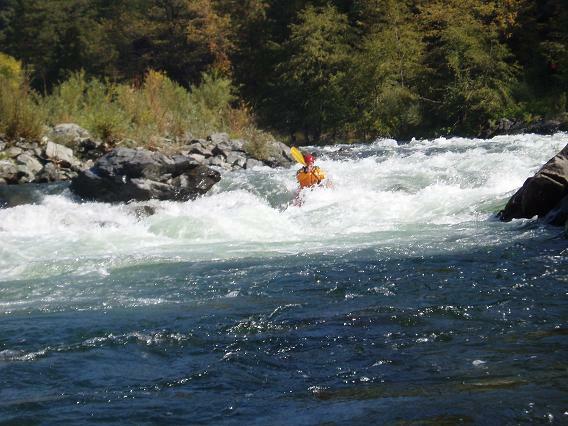 I have run this run as high as 6,500 cfs and have still had a blast. 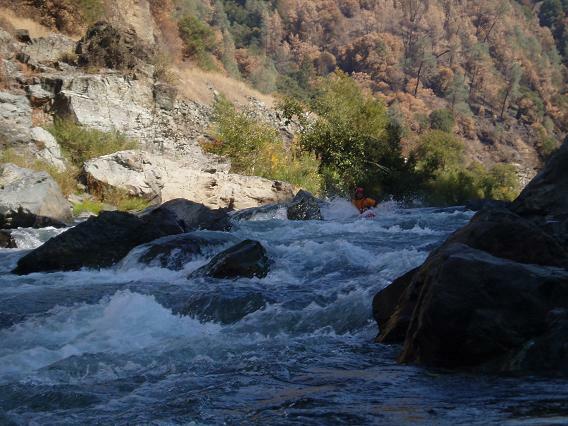 At the high flows most of the technical rapids become huge wave trains while rapids such as Sailor’s Bar and Fishtail remain tricky, either way…the rapids are still fun. Pigeon Point (II-). This is the site of the Trinity River Rodeo each year. The hole is on the right shore. However the hole was not present before 1997 and in 2004 started to fade from its prior glory. Good Morning America (II+). This rapid comes on a right turn. As long as you don’t enter on the left, the rapid consist of a fun wave train with a hole being the third or fourth wave. At most flows this hole/wave can be accessed as a nice play spot. Surprise (II). Another wave train taken down the left of center. Slot (III). 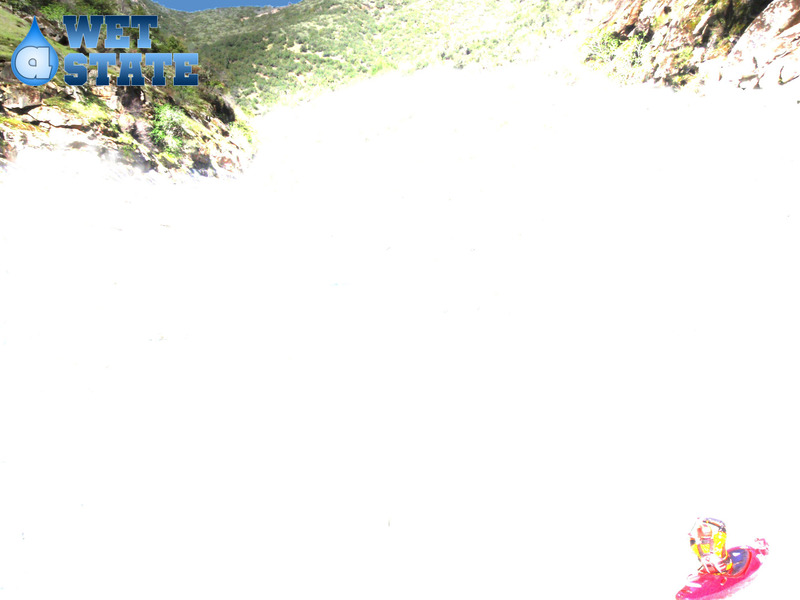 At high flows the bottom of this drop can appear hairy, but I have always been scooted on top of all the whitewater. The rapid consist of one drop. At low flows you will see that there is a slot (center) between two rocks. At high flows it becomes as airplane turn that is easy to follow. Just avoid going to far left as it is much nastier on that side. This rapid can be scouted from either bank. Double Eagle (II). This rapid come on a blind left turn and consists of a wave train with a occasionally somewhat exposed rock at the bottom on the far left (kind of where the current pushes you). Upper Tidy Bowl (AKA Left-go-Right) (III). At high flows this rapid has some of the biggest class III waves around…the type that put “First Threat” to shame. The waves are straight down the middle and it is the third (I think) that has back looped me (on accident). At low water levels the common line is to the left of the entrance rock (center). As soon as you clear the rock, move in behind the rock as to allow you to go to the right of the second midstream rock. Lower Tidy Bowl (II+). 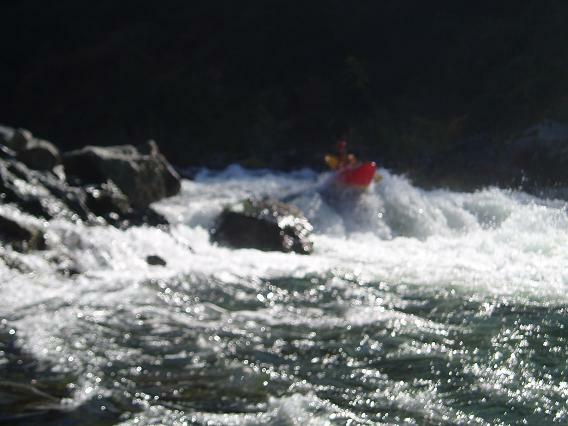 This rapid is simple at high flows when the rock at the bottom of the rapid is submerged. However at low flows you must commit to paddling either way around the rock otherwise the current will push you directly into it. 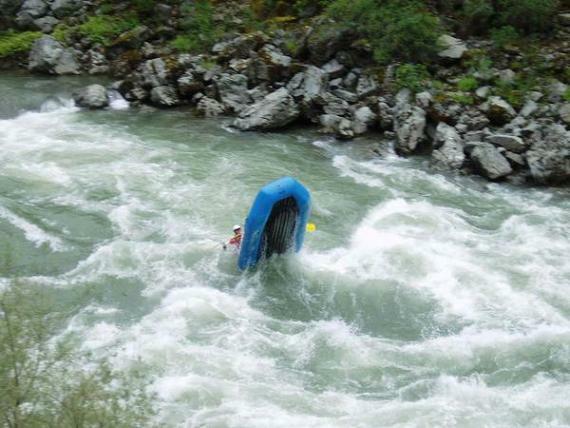 It is a simple move in kayak…but rafts have caused, even the best of us, problems from time to time. Hell Hole (III+). The key to this rapid is to not enter on the left wall (unless you are experienced in which case who am I to tell you what not to do). The left side of this rapid can push you against the wall/force you to the meat of the hole/flip you with great ease. So the two recommended lines are to start right and move left as you enter the drop into the meet of the hole, or start center and move right to avoid the hole. At flows in excess of 3,000 cfs a third line appears which is to the right of the drop and over what is shore at lower water levels, this line is class II and is merely a wave train. But don’t fret either way…a long pool and large eddy exist below to make rescues that much easier. The only injuries I have heard of on this rapid have been caused by rafters falling out of their boats before the rapid even picked up. Sailor’s Bar (III). In my mind this is the most fun rapid on the run. It is basically the same at all flows, though bigger and pushier at higher flows of course. Anyways, it is entered in center and about two-thirds of the way through the rapid, before the right turn there are a series of diagonal waves. The most fun line is to hit the diagonals and let them push you into the wave/hole at the bottom, large eddy on left for swimmers. Pinball (III). This rapid is another fun one. 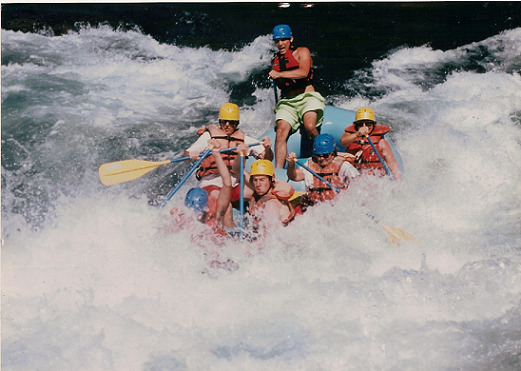 The rapid can be run on the right or left. Left is the common low water run. Enter to the left of the midstream rock and go over the ledge drop. Continue to hug the left shore down the narrow channel. At the bottom there is another ledge drop into a seventy degree left turn. 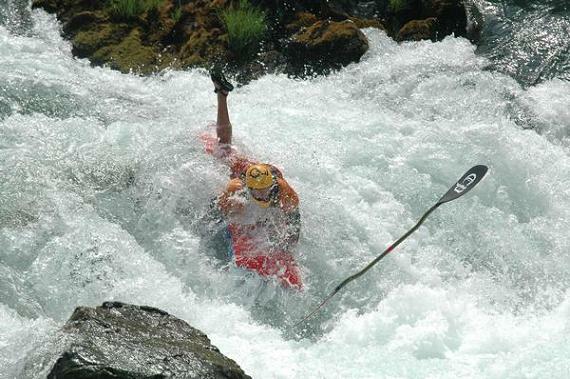 At high water, the right line consists of a few holes and waves with a crux move. The move is to avoid the submerged rock about two-thirds down the rapid. The rock makes a nasty hole. It is easiest avoided on the left but can be avoided on the right. At low flows, this side just isn’t that much fun as the waves are small. Fishtail (III). 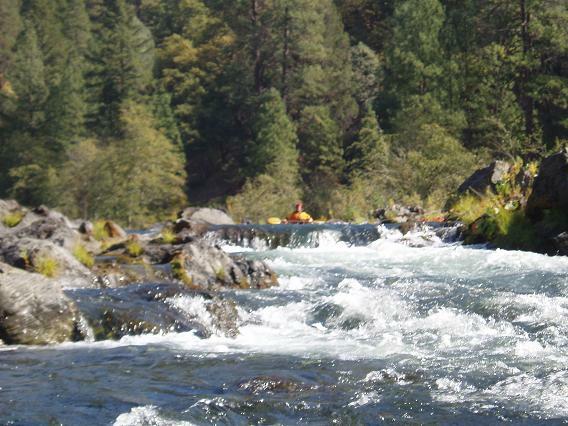 At low flows the entrance is more important for this rapid, enter far right and then move center in the middle of the rapid. At high flows the center can be run. However either way, on the far left about half way down, there is a large hole that many of rafts have surfed and/or flipped in. The end of the rapid is eight turn, avoid being to far on the left edge of the turn and avoid the wall on the right at the end of the turn. Take out: About twenty-five miles west of Weaverville on Highway 299 you will come to the small town of Big Flat. On the far side of the town, across from Trinity River Rafting, there is a small grass picnic area with a chunky ramp to the water. This is the common take out place. Put in: About seven miles back towards Weaverville you will come to the Helena Bridge crossing over the North Fork of the Trinity. You can put in on the right side of the road, either before or after bridge.